In the boxes: sweet peas fried with baby corn, homemade chicken balls, homemade prawn tempura & blueberries. Small containers: mayo. 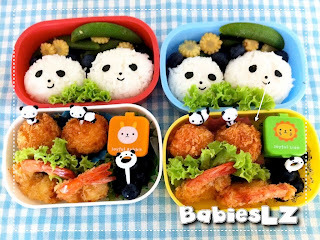 For sure they liked today's bento coz the boxes came back empty! Yay! So it doesn't matter if the features looked small at all!